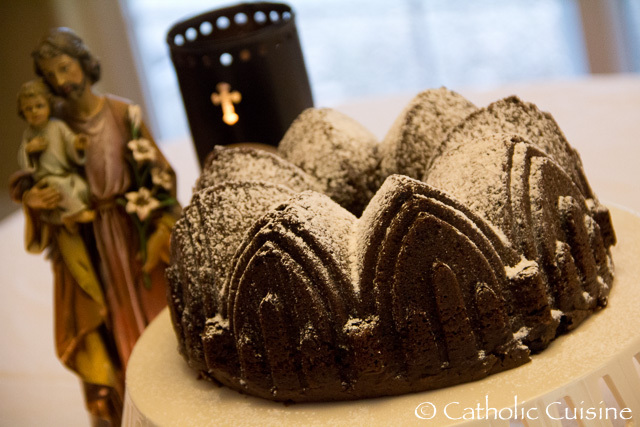 Bake a cake in a cathedral shaped pan in honor of St. Joseph, patron of the Universal Church. Some pan options include this Cathedral Bundt Pan, this Vaulted Cathedral Pan, and this Stained Glass Bundt Pan. Be sure to take a moment to offer a prayer for all priests! O illustrious patriarch St. Joseph, who carried the Infant Jesus in thy blessed arms and who, during the space of thirty years, lived in the most intimate familiarity with Him, take under thy powerful protection those whom He has clothed with His authority and honored with with the dignity of His priesthood, whom He has charged to continue His mission, to preach His Gospel, and to dispense everywhere His graces and blessings. Sustain them in their fatigues and labors; console them in their pains; fortify them in their combats; but above all, keep far from them all the evils of sin. Obtain for them the humility of St. John the Baptist, the faith of St. Peter, the zeal and charity of St. Paul, the purity of St. John and the spirit of prayer and recollection of which thou, my dear Saint, art the model, so that, after having been on earth, the faithful dispensers of the Mysteries of thy foster Son, Our Lord Jesus Christ, they may in Heaven receive the recompense promised to pastors according to the Heart of God. Amen. Additional recipes for the Solemnity of St. Joseph can be found in the archives. I have this same pan and was wondering if you have any tips for how to keep the cake from falling apart when you take it out of the pan. I've tried greasing it with coconut oil, melted butter, or light olive oil (and floured it with either flour or cocoa powder, depending on the cake), and I usually let it cool for about 10 minutes before flipping it over. Every time the cake sticks to the sides and ends up in pieces. Any tips? Thanks! Hi Deb, Have you tried a baking spray? I've used both the Pam Baking Spray and Wilton's Bake Easy and have never had a problem. It's not ideal - I'd prefer to use coconut oil or butter along with flour or cocoa powder, like you, which is what I do when I'm baking in normal cake pans - but they really work the best when it comes to some of my shaped pans. I haven't tried those - thanks for the suggestion and for taking the time to reply! Now I just need another excuse to make a cake. :-) Happy feast of the Annunciation!